This project was developed as a medium tank for the Indian Army. The work on the project was carried out by Porsche, Daimler-Benz, and Zahnradfabrik AG of Friedrichshafen from 1954 through 1955. However, the vehicle was deemed to be too complicated for production in India, and the project was canceled. 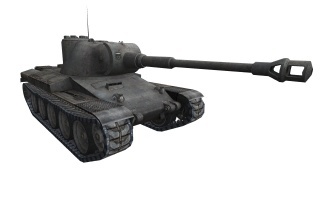 The Indien-Panzer is very similar, yet quite different from the alternate tier 8 German medium tank, the Panther II. 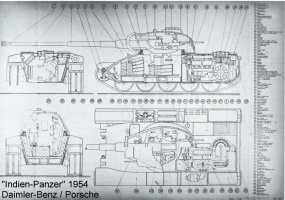 Unlike the Indien-Panzer, the Panther II offers an Tier IX 8,8 cm gun, boasting high penetration and extreme accuracy. 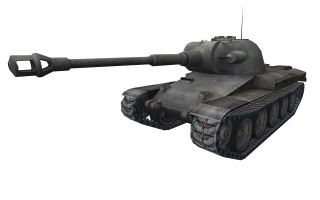 The Indien-Panzer however, in return offers a 9 cm gun, which can be researched after researching the 8,8 cm KwK 43 L/71 gun shared by both vehicles (which has almost identical stats on both the Panther and Indien). This slightly-improved 9 cm gun increases the Indien-Panzer's DPM by roughly 200 damage, nothing to get excited about. Though the Indien-Panzer has a weaker engine than the Panther II, it sports much less weight thus producing higher mobility. In addition, the Indien has much higher track traverse speed, which makes it handle much better than the Panther. In comparison to the other tier 8 medium tanks, the Indien-Panzer boasts a decent penetration AP round at 212 pen, and on-averavge alpha damage of 240 hitpoints. Its engine has a very low chance of catching on fire, unlike Maybach gasoline engines, a common choice in German vehicles. Probably the most distinguishing advantage of the Indien-Panzer is its excellent gun depression coupled with a very small and difficult-to-hit turret and high damage per minute. Unfortunately, the turret won't hold up if it does get hit. 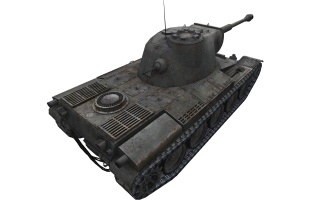 Finding and getting used to the Indien's play style will prepare its driver for the next tanks in the line, the Leopards, which are very similar in being very flexible, maneuverable, potent snipers, and capable jack-of-all-trades. The stock gun is thoroughly inadequate, and the upgrade should be researched early. Unfortunately, you can't mount the second gun or any equipment before upgrading the tracks or adding Enhanced Leaf Springs class 2. 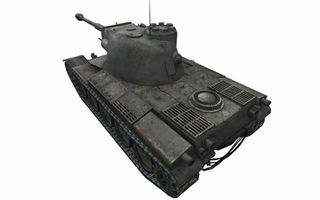 However, you can grind with the stock gun and get the 9 cm gun which is lighter and thus will allow you to mount it without having to get the upgraded tracks, but this grind can be rather painful with the stock gun's aforementioned poor stats, The top engine and top radio are unlocked when you research Leopard PT A, but consider at least researching the updated engine beforehand to improve your mobility. This page was last modified on 18 July 2018, at 16:52. This page has been accessed 36,300 times.